I'm pretty sure this is the source even though I found it in Google Images. Last week I retrieved my sewing machines from the back of the closet. They were put there in preparation of selling the condo and making space for La Baby. I often wish I could get a little bit of sewing time in AND I dream of doing a back carry with the Queen. Put those 2 wishes together and what do you have? A DIY project! Woot! Woot! I went to Hancock Fabrics and bought 5 yards of Osnaburg muslin for $15. I cut it into 2 pieces. I dragged my sewing machine and serger to the kitchen table. I was able to quickly serge around 1 of the wraps before the Queen signaled that she was bored and needed my full attention. I enjoyed the buzz and now I want more. I'm so inspired by all of the sewing blogs I read (270+ sewing related subscriptions!) and really want to make some time for it. My thinking was that if I could get her nicely wrapped then she would be content while I worked on projects. Well, I moved to fast on this. My fabric shrunk and getting her nice and tight on my back didn't happen. I was able to do a front carry and it's way better than the Moby. I imagine the machines having a soothing effect on her so a front carry would be good. She can burrow in my chest and get cuddly. Now all I need is my fabric and other sewing supplies that are in the buried deep in the storage room. I will have to convince Him to retrieve that stuff. Could be sewing again by Christmas any day now! Creatives, do you carve out regular time for your craft? How much time? What do you do with the bambinos? SN: I was going to take a pic of my new wrap but really it's just a long piece of fabric. If you care to see some of my previous sewing projects, I have pictures (7) posted on an old BurdaStyle Sewing Club. I'm a baby sewer. I've made pillows, baby blankets, floppy purses and simple dresses. I've been meaning to make a few throw pillows for our couch, because the ones we have are sooooo done, it's not even funny. 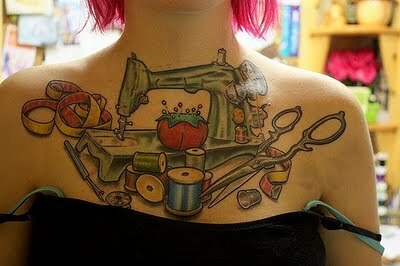 I need to take my sewing to the next level. I want my stuff to look pretty on the inside too.